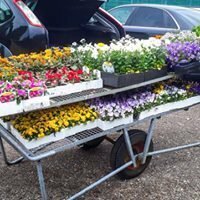 We recently received a very kind and generous donation of flowers and bedding plants from W.D. Smith & Son and garden items from Asda in South Woodham Ferrers in support of our "A Breath of Fresh Air" and "Runwood in Bloom" garden projects. Residents and their families enjoyed a lovely day in the garden working on the project and designing their own pots and hanging baskets whilst our greenfingered residents unable to join us in the garden were involved in planting pots of colourful splendour in the lounges.